CHARLOTTESVILLE, Va. — Virginia Tech student, Bradley Simmons, is in recovery after experiencing a series of severe medical complications arising from a recent liver transplant from a University of Virginia graduate, sources confirmed Monday. Simmons was admitted to the University of Virginia Medical Center for the complicated transplant procedure after being diagnosed with a rare genetic condition which rendered his liver unable to process alcohol. Faced with a lifetime without drinking or a series of increasingly severe medical risks and side effects the likes of which could cost him his life, Simmons chose the latter and underwent a full liver transplant. His donor, UVA graduate Sullivan McCarthy, known to his friends as “Sully,” to his close friends as “The Ruckus,” and to local law enforcement as “a definite flight risk,” died tragically in what witnesses described as an unfortunate Frisbee-related incident. In death, McCarthy gave Simmons a new lease on life by donating his liver. However, Simmons began to experience several complications. Formerly an engineering student, Simmons has apparently abandoned all pursuits into a field many consider useful and has instead begun applying to UVA’s McIntire School of Commerce. 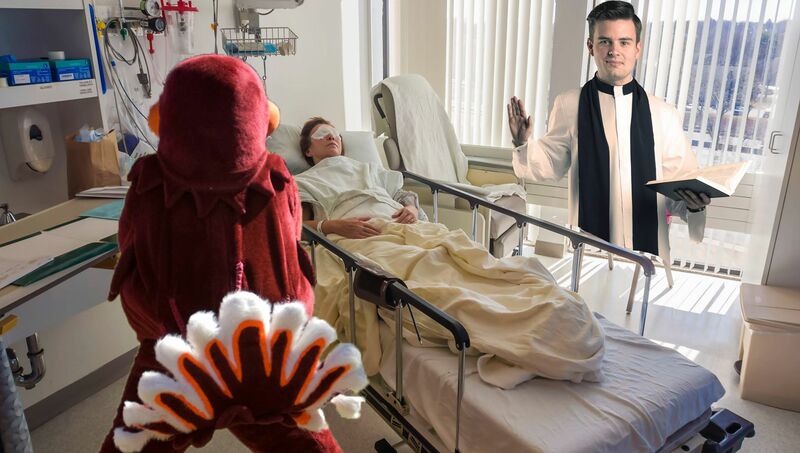 Simmons has since been re-admitted and is undergoing intense therapy which involves heavy doses of immunosuppressants, watching the last 15 years of Virginia Tech football games against UVA, and listening to Travis Tritt. You made it this far, so why not check out our online store while you’re at it?